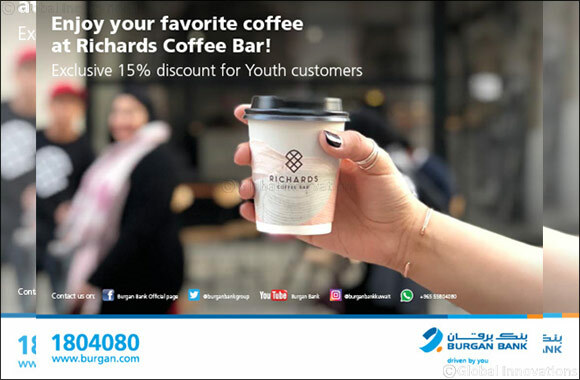 Kuwait - 30 October 2018: Promising its customers receive advantageous offers from popular outlets in Kuwait, Burgan Bank announced its latest partnership with Richards Coffee Bar that will entitle its Youth customers with an exclusive 15% discount. Youth cardholders can indulge in the genuine and unique taste of coffee beverages served at Richards Coffee Bar, famed for its coffee bean seeds collected from around the world. Burgan Bank seeks to keep abreast of modern preferences, especially for coffee lovers as coffee grabs a large sector of people in Kuwaiti society. As this new offer allows the customers to benefit from the discount on Richards Coffee Bar, the most prominent specialty coffee bar and professional roaster, situated in Kuwait City. Richards Coffee bar provides a fun and comfortable atmosphere surrounded by soothing music, company and world- class service.